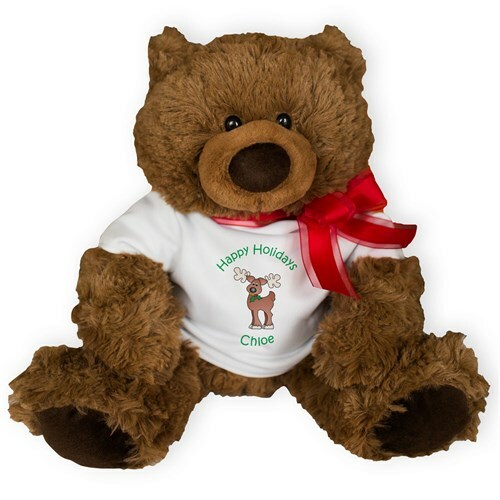 Coco Bear is an adorable Christmas Gift that is suitable for everyone on your shopping list. Coco is ready to bring your family and friends the warmest wishes this Christmas. His fur is soft, silky and completely irresistible for cuddling. He wears a t-shirt that may be completed with up to 2 custom message lines. Free Gift Wrapping and a Free Gift Card are included to create a thoughtful presentation. Additional Details Shop 800Bear.com for all your truly unique and special Plush Christmas Stuffed Animals. They are perfect for both kids and adults to enjoy each and every Christmas holiday.